Ken Gheysar, 48, was on his way to Palomar Airport in Carlsbad, Calif. when the small plane he was flying ran out of gas, forcing him to land in the southbound lanes of I-15, near Escondido, Calif.
As luck would have it, traffic was light and the 1968 Piper landed without incident. 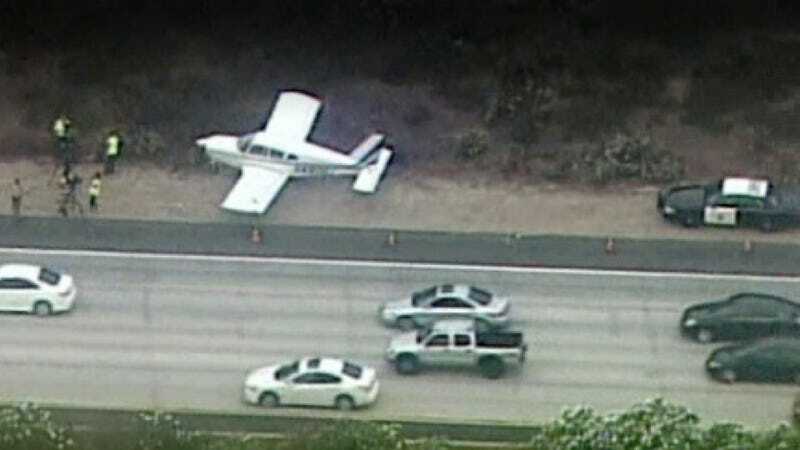 The California Highway Patrol said the plane had four passengers aboard, none of whom were injured. The plane was moved to the shoulder until it could be removed from the freeway. But at some point, a motorist passed too close to the plane and hit the end of one of its wings, causing minor damage to the vehicle. It's not clear where Gheysar was flying from, but we're sure his explanation for why he ran the plane's tank dry was a good one.